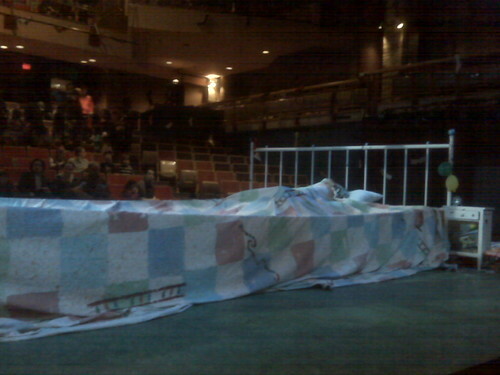 The Young People's Theatre, or Lorraine Kimsa Theatre for Young People (LKTYP) as it's now known, hosted the North American premiere tonight of The Monster Under the Bed. I was lucky enough to catch it from the first row with my kids, who wore their pyjamas to this giant PJ party. Performances at the LKTYP are consistently great, and it's always a big bang for the buck. The way I judge these plays is I watch my kids' faces. Tonight they were wide eyed and thoroughly entertained by The Monster Under the Bed, and that makes this another winner. If you've got kids between the ages of 5 and 12 and you're looking for something to do this March break, you might want to click here and order tix to this thing. It features a giant bed and tonnes of fun.